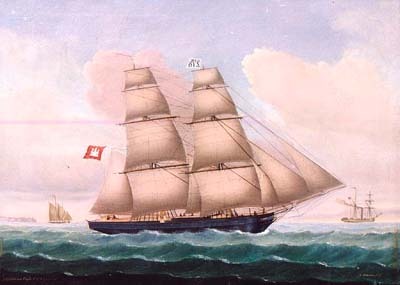 A brig is a two-masted vessel with both masts square rigged. On the aft mast, the main mast, there is also a gaff sail, in some languages referred to as the brig sail but in English often called the spanker. Some brigs have the gaff sail rigged on a separate mast just a bit astern of the main mast. This mast is called the snow mast, and such a brig is called a snow brig. The brig with her two fully squared rigged masts possessed some unique sailing qualities, and a skilled master could maneuver her with great ease and elegance; a brig could for instance turn around almost on the spot! They varied in length between 75 and 130 ft. (23-40 m). The voyage from Hamburg to America could take up to two and a half months.